The below artworks are the most important in The Barbizon School - that both overview the major ideas of the movement, and highlight the greatest achievements by each artist in The Barbizon School. Don't forget to visit the artist overview pages of the artists that interest you. 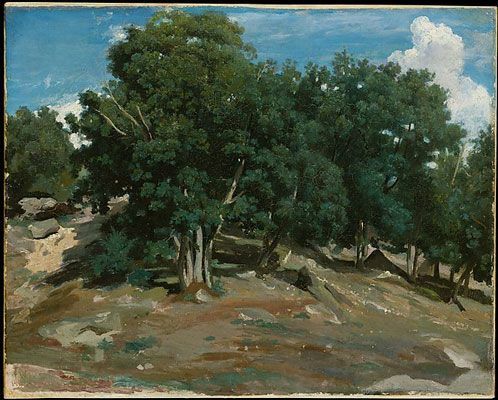 Artwork description & Analysis: This image of a section of the forest famous for its large Oak trees exemplifies the naturalistic treatment that Corot explored at Barbizon (having first developed the technique in Italy in the late 1820s). The colors of the earth, the rugged tree trunks, and their precise foliage are almost photographic in their rendering. The viewer's eye is drawn into the woods and to the sky above, where the shape of a billowing cloud echoes the foliage of the trees. Reflecting the Dutch landscape painters' practice of depicting the landscape in three horizontal bands, Corot expands the middle zone of the trees so that a sense of their vitality and expansiveness is conveyed. In this early work from the group, Corot brought a modern directness to landscape painting, putting aside both the Neoclassic tradition of landscape as backdrop and Romanticism's preference for sublime nature, in order to simply portray the landscape as he saw and felt it. The simplicity of the subject matter and its detailed observation reflect this. 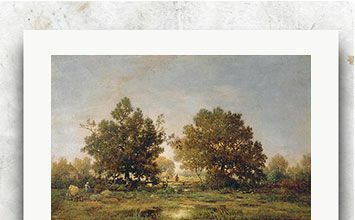 Corot reused the large tree that forms the focus of the image in his painting Hagar in the Wilderness (1835) which was displayed at the Salon the same year. 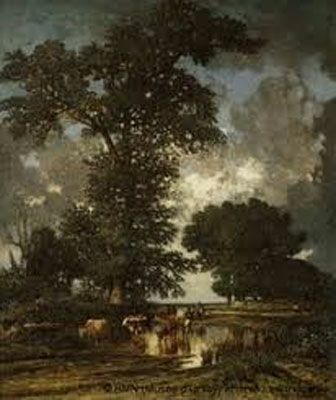 Artwork description & Analysis: Depicting a quiet pond, where a herd of cattle are drinking, this image emphasizes the towering oak tree that rises from the low horizon up to the stormy sky. The tree dominates the image, reaching out to the edges of the canvas on two sides and forming an intense focal point for the viewer against the whites and greys of the clouds. The herdsmen driving the cattle are barely visible, suggesting the insignificance of humanity in comparison to nature, represented by the oak. 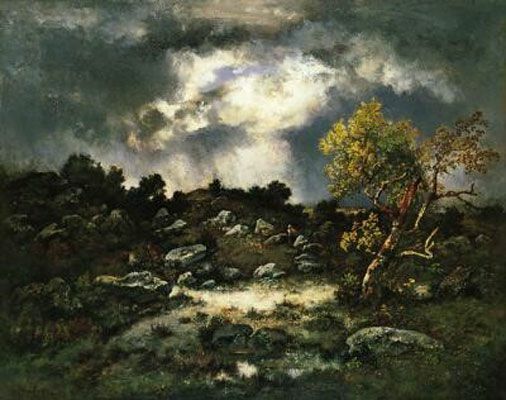 Whilst demonstrating a naturalistic treatment of elements within the image, the painting is essentially a product of Romanticism conveying the power of nature through both the oak tree and the dramatically lit clouds which threaten an impending storm. Whilst visiting England in the early 1830s, Dupré encountered the work of John Constable. This landscape with its precisely depicted botanical details, muted but realistic hues, and subject matter showing a quiet scene of rural life demonstrates Constable's significant influence on Dupré. Dupré is sometimes credited with bringing the English style of landscape painting (of which Constable was a key proponent) to France. Whilst it is highly likely that Dupré popularized the style amongst members of the Barbizon School, Constable was certainly not unknown in Paris prior to this point due to his exhibition of paintings at the Salon. Artwork description & Analysis: This photograph depicts a single great beech tree in the Forest of Fontainebleau that seems to lean back as if tearing free of the earth and exposing its roots. As a result, the tree conveys a sense of movement, a dynamic energy, as its foliage fills up the picture frame, its trunk glowing with sunlight. Le Gray's work brought the then new art of photography to the Barbizon School. He was one of the most important early French photographers, due to his iconic photographs, his technical innovations in the medium, and his influence as a teacher. His students included Charles Nègre, Henri LeSecq, Olympe Aguado, and Masime Du Camp. Like the painters, he often depicted the forest by focusing on particular trees, which became dynamic, central characters. As a result, a mutually influential relationship developed between photography and painting in Barbizon. 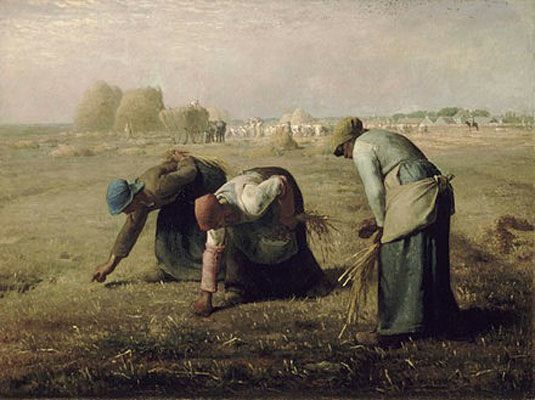 Artwork description & Analysis: This painting is one of Millet's most famous and embodies the Realist emphasis that he brought to the Barbizon School. As he walked the fields around Barbizon, the artist often saw scenes of gleaning. This was an ancient practice of collecting leftover crops from harvested fields. The right of gleaning was enshrined in law and this allowed poor families to supplement their, often meager, diets. In the background of the image are signs of the abundance of the harvest. The horse drawn cart overloaded with wheat, the crowd of harvesters returning home, and the steward on a horse are bathed in a shimmering golden haze distancing these visions of plenty and, in the case of the steward, social status from the poverty of the women. On the other hand, the heavy shadows of the foreground obscure the women's faces, making them anonymous figures worn by hard and repetitive labor. As a result, a contrast between poverty and plenty, and between the natural beauty of the fields and the tattered, work-worn women, is created, producing a powerful social commentary. The work was accepted to the Salon, where it received very mixed reviews. It was praised by some for its dignified representation of the rural poor whilst others criticized it for its realism, ugliness, and social radicalism, linking it with the new socialist movements and acting as an uneasy reminder of the Revolutions of 1848. The painting was over a meter in width and this contributed to its censure as canvases of this size had previously only been used for religious or mythological subject matter and Millet's depiction of poor women was not seen as an appropriate subject for the scale. 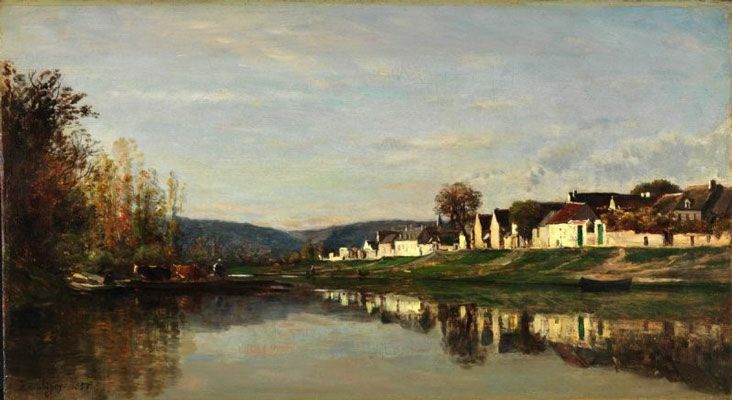 Artwork description & Analysis: In the late 1840s, Daubigny, interested in painting river views, moved from Barbizon to Auvers-sur-Oise, another area close to Paris and known for its natural beauty. This riverscape, depicting a sunlit village and its reflection in the water comes from this period and shows the artist's strong sense of composition honed during his time in Barbizon. The bank of the river and row of houses on the right directs the viewer's gaze toward the horizon and this is mirrored on the left of the image by the thick grove of trees which forms a softer diagonal, ending at the same perspective point. The white of the houses and the red roofs add color to the otherwise pastoral scene. Despite the presence of figures on both the bank and river, a feeling of quiet contemplation and harmony pervades the piece, created by the stillness of the water and sky. Daubigny built a studio on a houseboat which he called Le Botin (Little Box) to paint scenes along the Seine and Oise Rivers, and this work was painted from the boat, allowing the vantage point of the piece to be mid-river. Daubigny's pioneering practices of painting sur le motif, or in one session and applying wet paint onto wet paint, combined with his brushwork and his emphasis on the reflected play of light, influenced a number of the Impressionists, particularly Monet with whom he became close friends and who later similarly outfitted his own boat. Van Gogh was also influenced by Daubigny, as seen in one of his final paintings, Daubigny's Garden (1890). Artwork description & Analysis: This painting depicts a grove of towering ancient oak trees at Bras-Bréau, their massive and twisted trunks lit up by sunlight, so that the trees themselves become the focus of the painting, celebrating them as symbols of power, persistence, and beauty. Rousseau expressively renders the scene using a palette of greens and an impasto technique to produce an intense depth of color and a complex interplay of light and shade which hints at a darker and more mysterious side to the forest. 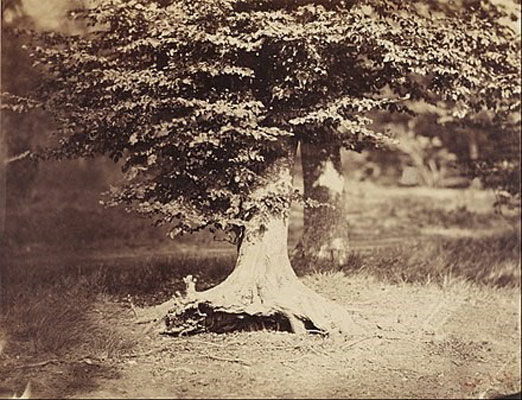 The figure of the man to the right in a small patch of sunlight is easily overlooked, suggesting the human presence as transitory and minor among the ancient trees. Rousseau was passionate about the Forest of Fontainebleau and later was a leading advocate for its preservation from human development. He would trek into the woods for days at a time, often leading and mentoring other painters on outdoor painting excursions. 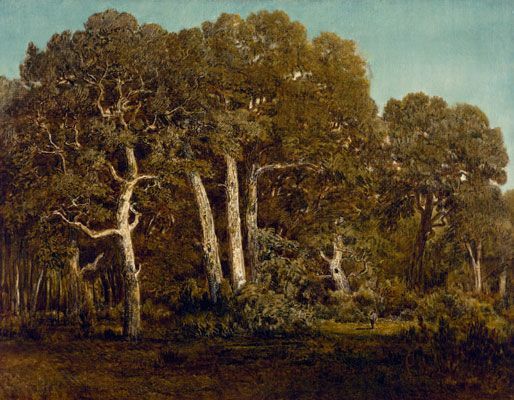 He was considered the master painter of the forest and his advocacy and techniques attracted a number of followers to Naturalism. 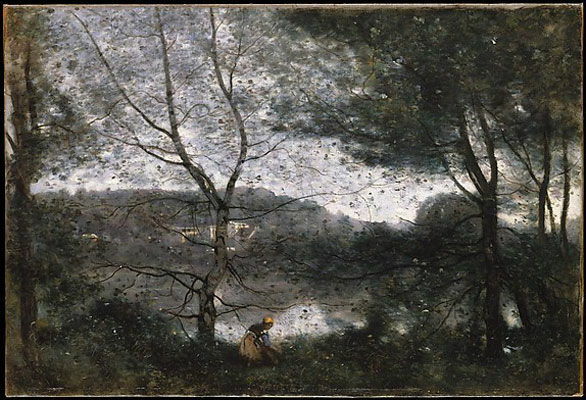 Artwork description & Analysis: In this later work, Corot returned to one of his favorite subjects, the view of the lake on his family's estate. Like many of the artists associated with the Barbizon School, Corot often visited the Forest of Fontainebleau but never resided there and he painted other rural areas as well. At first, he included a woman and child in the center of the image, but later removed the child perhaps finding its presence too sentimental or narrative. As a result, the woman is simply part of the landscape, the yellow of her skirt and head covering adding a bright counterpoint to the silvery water behind her. The painting conveys a sense of nature as all-encompassing, a delicate web interweaving the sky, the water, and the earth. When it was shown at the Salon of 1870, the critics praised its quiet lyricism. The influence of photography, which Corot took up in the 1860s, can be seen in the work's monochromatic tonality, the unusual depth of field, and in the blurring of the foliage in the foreground which merges with the sky to form an abstract pattern. As with photography, there is also a clear emphasis on the effect of light which forms shapes on the lake, highlights the buildings in the background, and pours from behind the vegetation on the horizon giving the piece an ethereal luminosity. Artwork description & Analysis: This image highlights Diaz's talent for creating theatrical lighting effects; a shaft of sunlight pierces the stormy sky, powerfully illuminating the rocky landscape, the single tree, and the lone human figure in the distance. This work shows Diaz's preoccupation with strong contrasts of dark and light which emphasizes the impending storm and conveys a dramatic feeling of overwhelming natural forces through which the distant individual must find her way. Whilst the piece contains themes of isolation and imminent struggle there is no direct narrative and this allows the viewer to construct one, writing their own experiences onto the work. There is an element of the fantastical about the piece and this can be seen as the Romantic influence on the artist. This is enhanced with loose brushwork and a wet on wet technique creating a vigorously textured surface which serves to heighten the drama of the work. Artwork description & Analysis: Corot began painting Italian peasants in traditional costumes on his first trip to Italy and he retained an interest in the subject matter throughout his career. Earlier examples include Italian Peasant Boy (1825) and Two Italian Peasants (1843). Of the artists associated with the Barbizon School, Corot (along with Millet) was one of the few who was as known for his figurative work as much as for his landscapes. He believed that there was an integral connection between the two, noting that, "If someone knows how, without any tricks, to get down a figure, he is able to make a landscape; otherwise he can never do it". 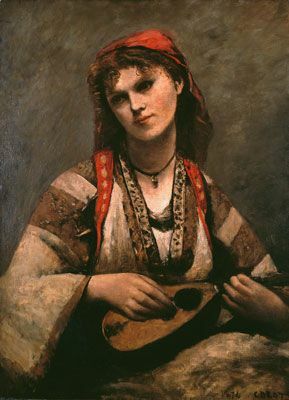 This is a studio painting and as with most of his portraits, the tones are muted, punctuated, here, by the red of the trimming and head covering giving the girl a feeling of youth and vitality. The figure stares passively to the left of the canvas, the diffused lighting emphasizing her face and neck. These are rendered in a detailed fashion which contrasts with the looser brushstrokes of the clothing and background. The work is infused by a sense of calm and solitude. Both Pablo Picasso and Juan Gris were inspired and influenced by this work and others like it, as seen in Gris's Woman with a Mandolin (after Corot) (1916) and Picasso's Girl with Mandolin (1910). First published on 19 Apr 2018. Updated and modified regularly.